Dual-screen action allows your child to interact with the handheld screen and see the learning unfold on the TV screen. 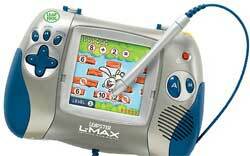 The full Leapster and Leapster L-Max library allows your child to play action-packed games while learning essential preschool through 4th-grade skills! Meet FLY, the incredible pentop computer that's creating a huge buzz. FLY actually reads and remembers what you write, using a powerful optical scanner and a built-in processor. Then it uses that information to help you take notes in class, manage your schedule, play games and more. It's the future of personal computing, and it's right at your fingertips. From sitting and crawling to standing and cruising, baby can learn up, down, and all around this smart playground. Two learning modes: learn and grow and compose and play. Just flip the smart book page to transform learning activities into musical adventures. The Learn-Around Playground teaches learning songs, shapes and textures, colors, and rhyming words. Use the Learning Guide card to the right to find out more about the general categories of learning for the Learn-AroundT Playground. By clicking a category on the Learning Guide card, you'll see a list of knowledge areas that children develop when they play with this product and the skills on which those knowledge areas are based. This interactive, musical activity table engages and entertains baby with songs, melodies, real instrument sounds, and lots of things to spin, roll, slide, open and close. 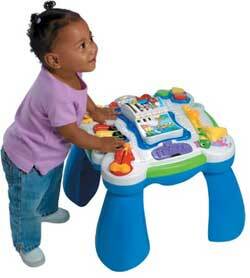 The LeapStart Learning Table plays over 40 songs and melodies so your baby stays entertained while exploring. When babies turn the center page, the activity table switches modes and transforms musical discoveries into learning activities where each instrument plays a learning song - about the alphabet, counting, shapes or colors. As babies experiment with their world and learn to stand, little hands are busy reaching, grabbing and pulling. 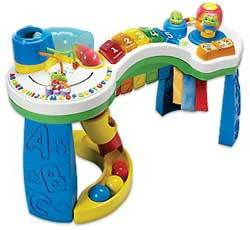 The LeapStart Learning Table gives your baby something to hold. Contoured grips make pulling up easy and help babies develop important motor skills. Songs, melodies and sounds from real instruments engage little ones and encourage them to push, pull, spin, slide, open, close and roll. Plus, twinkling lights follow along with every tune. The LeapStart Learning Table features detachable table legs for infant floor play, a volume control and an automatic shut-off. Open a LeapPad and a whole world of learning opens up. 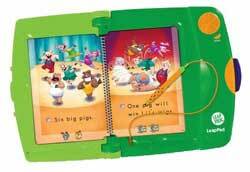 Put a book on the LeapPad player and pop in the cartridge. Stories suddenly come to life with the light tap of the Magic Pen. Touch a word and sound out each letter. Then spell it and define it. Silly songs serenade. Characters charm everyone with their hilarious sense of humor. The award-winning LeapPad Learning System teaches fundamental reading skills in a way that keeps your child coming back again and again. 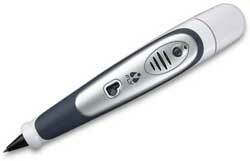 The Magic Pen helps young readers practice critical pre-writing skills. The games will make them gleeful and the activities will keep them busy as bees. They'll be mesmerized with the possibilities of learning. And with over 50 titles to choose from, and all the books from the Quantum Pad® Library, they'll stay mesmerized for quite a long time. When books talk back, every word is an adventure. And with volume control, headphone jack and automatic shut-off, the books don't have to talk too loudly.